Golden Apples: NOT SOCK!- Story to follow. For Neen (and others) I've included a a view of the 'side (seam as it were) where the BoR is—I mentioned on Ravelry, that while I obsess about cast ons, JOGS don't bother me in the least! I do make a small effort to obscure them,--and an other small effort when I weave in the tails, but not much. Neen was concerned how the back of my sock would be spoiled by jogs—but since I knit 2 on 2 circ's –using a method of my own to start –my Beginning of Round (BoR) is at the side, not at the center back. (and I sort of agree about the center back of the leg—its very noticable when going up strairs—and I do that all the time on the subway! The stitch patterning does a lot to obscure the jog—but you can see I rather clearly at the heel gusset in the RED, where the decreases make the jog very evident (who cares? It in the heel!) Another trick I used—and this works perfectly--was I alternated the BoR, and sometimes started a new color on the Mid point—half a round away! 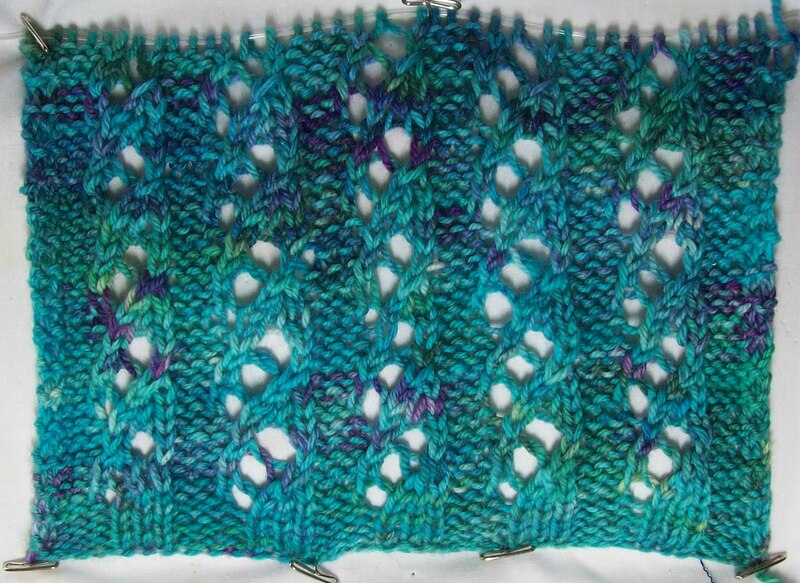 I still knit my 5 round--(it works-its just a variation of spiral knitting) and ended them at the mid point. 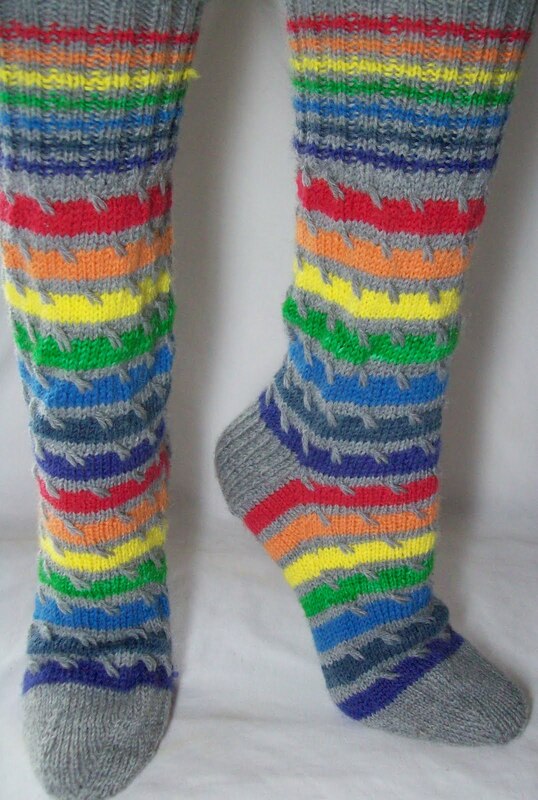 But the news of the day is, I finished ROY G BIV, and didn't cast on new socks! Instead—I found a new pattern for the Pagewood Farms wool and cashmere—and look—5 repeats of the lace pattern completed. I've slightly stretch (and in the end, I will do the same when I block) to open the pattern up so you can see it. Of course there are still socks (potential socks!) clamoring for attention in the back ground –5 pre-packed sock club bags, and as many again in my mental queue! The socks are truly lovely! You, m'friend, make the most beautiful socks! I'll cast mine on in the morning. 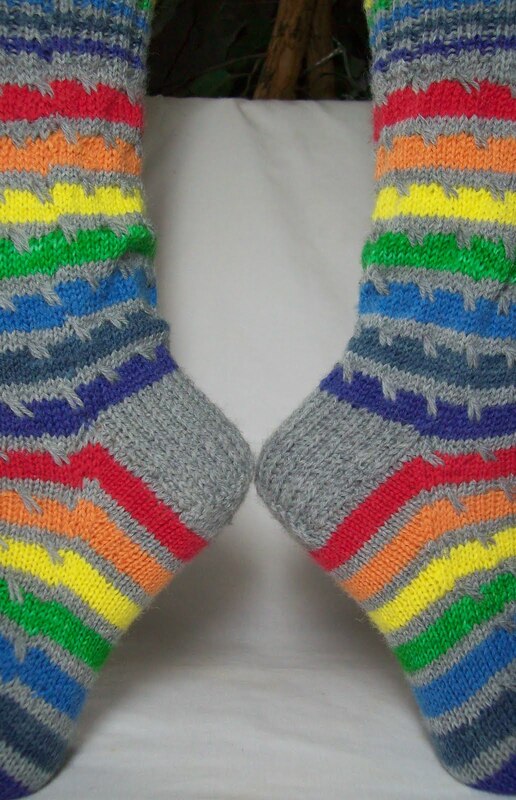 So pleased to see these socks, they are fabulous, I bet you love wearing them.